1 Begin by making the spiced carrot cake. Cook the carrots in boiling water for 15-20 minutes until tender. Drain well then place in blender with the pineapple chunks and juice and whiz to a fine puree. Leave to cool. 2 Preheat the oven to 170c, gas mark 3 and grease and base-line two 20cm spring form cake tins. 3 In a medium bowl, sift your flour, spices, salt and bicarbonate of soda. In a separate larger bowl, mix your oil, eggs, orange zest, sugar, carrot and pineapple puree, vanilla bean paste, desiccated coconut and chopped walnuts until very well combined. Gently fold the dry ingredients into the wet ingredients until just combined. 5 Make the limey cream cheese icing for the middle of the cakes, by mixing together the mascarpone, soft cheese, icing sugar and lime zest and juice until you have a smooth thick icing (you can do this up to two days in advance). Chill until ready to use. 6 To make the Italian meringue icing, pour the sugar and 90ml water in a small heavy bottomed saucepan, and attach a sugar thermometer to the pan, if you have one. Slowly bring the mixture to a boil over a medium-low heat, stirring occasionally with a wooden spoon. Have a pastry brush and a cup of cold water on hand to wash down any sugar crystals that get stuck to the side of the pan. If you let them build up, they will attract other bits of sugar and build up, so it won’t make a smooth sugar syrup. The sugar is ready when it reaches 120c on the sugar thermometer. If you don’t have a thermometer, test the syrup by dropping a small teaspoon of the mixture into a cup of cold water; it should set into a firm ball that can be squashed between your fingers. If it just dissolves into the water, the syrup is not hot enough. If it sets into a hard ball that can’t be squished then it is too hot for making Italian meringue, let it cool for 2 minutes or so, to bring it down to the correct temperature. 7 While the syrup is cooking, whisk the egg whites on a low speed in a stand mixer until frothy. When the sugar is nearly hot enough, increase the speed to high and continue whisking the egg whites until they form stiff peaks. As soon as the syrup is at 120C, turn the mixer speed to medium and pour the hot syrup in a slow steady stream onto the stiff egg whites. Try not to pour it onto the wire of the whisk or sides of the bowl – as it will cool quickly, harden and stick to cold metal. Once you have added all of the syrup, whisk the meringue on a high speed until the mixture is stiff and shiny, which will take 5-7 mins. Allow to cool completely then cover with clingfilm and chill until ready to use. Italian meringue can be stored in the fridge for up to two days. 8 To make your meringue decorations , preheat the oven to 200C, gas mark 6. Line a small baking tray with baking parchment, pour in the caster sugar and heat it in the oven for 7 minutes. Heating the sugar helps to create a glossy, stable mixture. 9 Meanwhile whisk the egg whites in a free standing mixer or a non-plastic bowl. At first whisk slowly allowing small stabilizing bubbles to form, then increase the speed until the egg whites form stiff peaks. Take the sugar out of the oven and turn the oven down to 120˚C, gas mark ½. With your mixer on full speed, very slowly spoon the hot sugar into the beaten egg whites, making sure the mixture comes back up to stiff peaks after each addition of sugar. Once you have added all the sugar, continue to whisk on full speed until you have a smooth, stiff and glossy mixture. Add the vanilla seeds and continue to whisk for at least 5 minutes until the sugar has dissolved. 10 Line four large, flat baking sheets with baking parchment or silicon sheets. Fill a disposable piping bag with half of the mixture, and cut a 50p sized hole in the tip of the bag. Pipe out 30 x 3cm meringue swirls onto two of the prepared baking trays. Bake for 40-50 mins until they easily come off the baking paper with their bases in tact. 11 Spread the rest of the meringue mixture out on the two remaining prepared baking sheets to a thickness of 5mm. Sprinkle with all your amazing edible baking decorations and bake for 40-50 mins until the meringue has dried out. Leave to cool, then removed from the tray and snap into long shards. 12 To assemble the cake, place one layer of the carrot cake on a festive cake stand or platter. Spread a third of the limey cream cheese icing on the top and sandwich with another layer of cake – continue until all 4 layers are stacked up. Use a palette knife to spread a smooth layer of Italian meringue around all the sides and top of the cake. Give it a thicker, ruffled layer on top to resemble snow peaks. 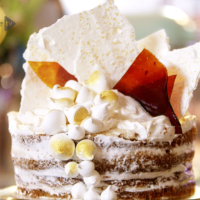 13 Dip the bases of the meringue kisses in gold stardust and arrange in a tumbling effect over the top and down the sides of your cake. Finish off with the glittery meringue shards. 14 For the caramel shards. Pour the caster sugar into a dry frying pan and place on a medium heat. When all of the sugar has melted and turned a deep golden colour remove the pan from the heat. Pour the sugar onto a lined baking sheet and leave to set. Once completely set break into shards with a rolling pin. Christmas cake never needs to be a non-event again!